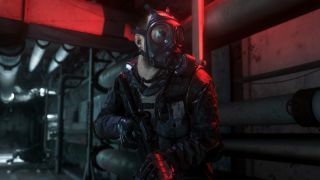 Two more maps have been added to the list of multiplayer arenas that Call of Duty: Modern Warfare Remastered players will be able to enjoy when it launches November 4 on PS4, Xbox One, and PC. In an interview with Forbes, Activision confirmed that "Bog" and "Overgrown" would be coming to the HD-ified version of the 2007 FPS. Taking place in a swampy junkyard filled with debris, Bog is fairly open map, without a lot of cover for your soldier. Similarly, Overgrown, takes place on farmland covered with lush vegetation and only a few buildings, which are in the process of being reclaimed by nature. Bog was only part of the original Modern Warfare, but Overgrown was available for both Modern Warfare and Modern Warfare 2. Raven Software is heading the remake's development, and studio director David Pellas told Forbes that Overgrown was actually a cornerstone of their entire approach to multiplayer. "We used that as our beautiful corner, our proof of concept of what we’re aspiring to get. And we worked on the foliage, we worked on the grass, we worked on the wind, the sky, the buildings, the textures. So much love went into crafting Overgrown and making it just an amazing experience, amazing visuals, that we then used that as kind of our temperature gauge on the other maps that we were working on." There are still five more maps yet to be revealed, but no matter what they are, consider this your gentle reminder that none of them will be available unless you buy a special edition of Call of Duty: Infinite Warfare, as Modern Warfare Remastered will not be sold separately.